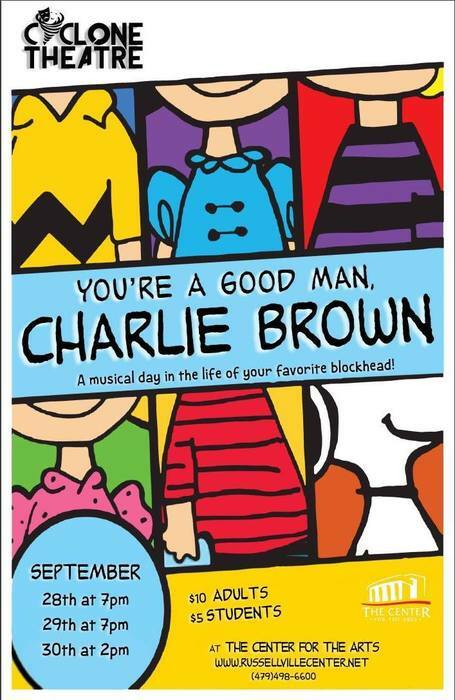 "You're A Good Man, Charlie Brown" is a fun-filled musical highlighting a day in the life of the beloved Peanuts characters by Charles Schultz. Linus totes his blanket as Lucy pines after the Beethoven-loving Schroeder, Sally explains her philosophy of life while Charlie Brown laments about baseball and Snoopy begs for Suppertime! Guaranteed to please audiences of all ages!" Presented by Cyclone Theatre on September 28 &29th at 7:00pm and on Sept 30th at 2:00pm. Contact our box office at 479-498-6600 for ticket information. Opening TOMORROW night! "The Music Man" is a musical based on a story by Meredith Wilson and Franklin Lacey. The plot involves a con man, Harold Hill, who masquerades as a band organizer and sells band equipment to naïve townspeople. However, as the story unfolds, it becomes clear that Harold is not what he claims to be and he plans to skip town without fulfilling his sworn obligations. Marian, the local librarian and piano teacher, begins to see through Harold's ruse but when Harold starts aiding her younger brother Winthrop in overcoming his lisp and anxieties, Marian falls in love. This award-winning, critically acclaimed Broadway classic is an all-American institution, full of quirky characters, charmingly predictable over the top situations, an incredible musical score of rousing marches, a hilarious group of townswomen, barbershop quartets and sentimental ballads. The show is produced by River Valley Arts Center and will be showing June 22-23 and June 29-30 at 7:00 pm and June 25 and July 1 at 2:00 pm. Tickets are $18 adult and $10 children. Tickets will be available at the door. It's show week!!! Cyclone Theatre students have been working so hard for months to bring this awesome show. The set is amazing and straight off the Broadway tour. You will not be disappointed!! Tickets on sale now or at the door. Adults $10 and students/children $5. All seating is general admission. 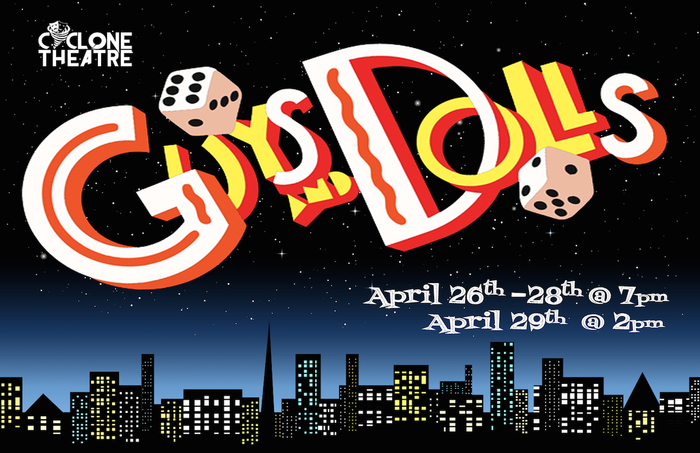 Thursday - Saturday at 7:00 pm and Sunday at 2:00 pm. Come join us! 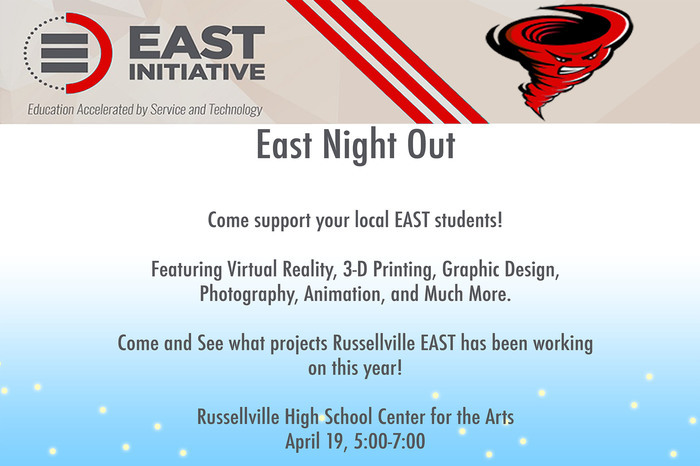 RHS East Night Out tonight from 5:00 pm - 7:00 pm. East students support a lot of activities not only in the high school but the district and community as well. Come and learn about some of the technology they use to produce their projects. Free and open to the public. On A Summer's Night: An Evening of Classic Rock will be at 7PM Saturday, June 16th at the Center for the Arts. This event is a concert fundraiser benefiting Arkansas Center for Music Education. 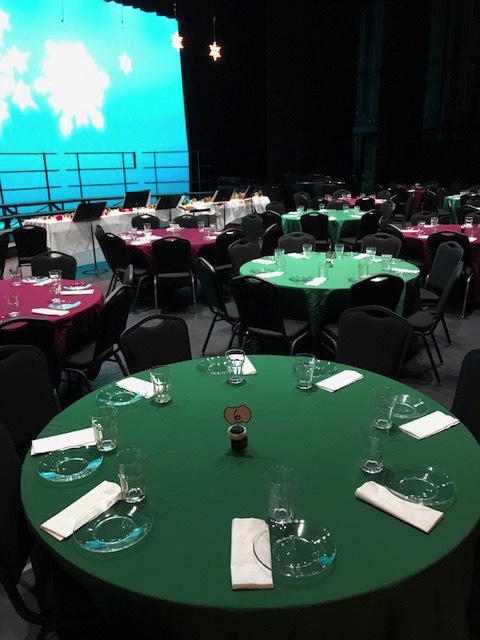 Led by musical director Dr. Brian Faulkner and artistic director Larry Roberts, of RedBea Productions, some of Arkansas's best musicians come together in support of community music education. The show will be performed as a live radio show with DJ Rich Mann (Richard Minnick) taking us through the music of such greats as Doobie Brothers, Chicago, Journey, the Beatles, Fleetwood Mac, REO Speedwagon, Heart, STYX, Kansas, BTO, the Eagles, Boston, and a host of other artists from the 60's to the 80's. RSD K-5 Art Exhibition -Russellville School District will host a Student Art Exhibition featuring artwork from 25 students in grades kindergarten-5th from each RSD elementary school. The Exhibition will take place Sunday, April 8, 2018, from 2-4 p.m. at The Center for the Arts. The Student Art Exhibition will showcase the strongest fine art pieces from each school and students will be presented with award certificates after the show. Parents and community members can view the Exhibition until April 12, 2018, from 9 a.m. to 4 p.m. at The Center for the Arts. 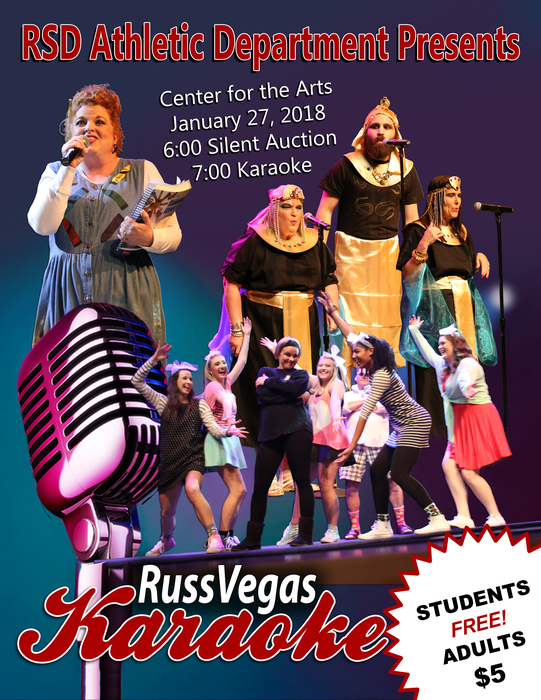 Russ Vegas Karaoke this Saturday! Join us at 6:00 pm for a Silent Auction and 7:00 pm for Karaoke. Tickets are $5 for adults and students are free. All proceeds go to benefit the RSD Athletic Department. JUST ANNOUNCED!! Chonda Pierce Getting Back to Funny Tour coming to The Center, Sunday, April 15, 2018 at 7:00 pm. 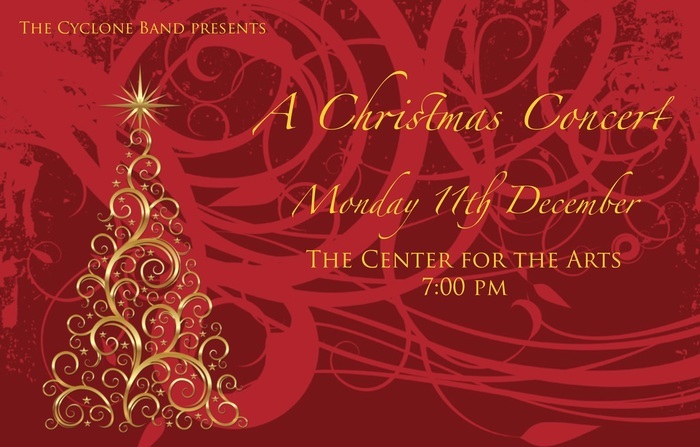 Join us tonight at 7:00 pm for the annual Christmas Concert by Russellville Middle School band. The event is free. Big news coming FRIDAY at 10:00 am! Be on the look out!! Join us tonight for a FREE holiday concert by Cyclone Band! 7:00 pm. Beautiful fun night ahead at the Feast! 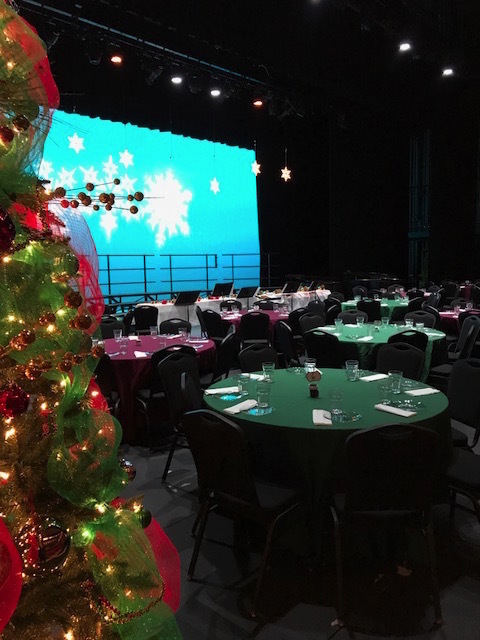 What a great celebration of holiday music will be happening at The Center this weekend. The RHS Choir presents Feast of Carols and Dessert Carols tonight thru Sunday. Both will held on stage. Happy Holidays!! Do you love comedy??? 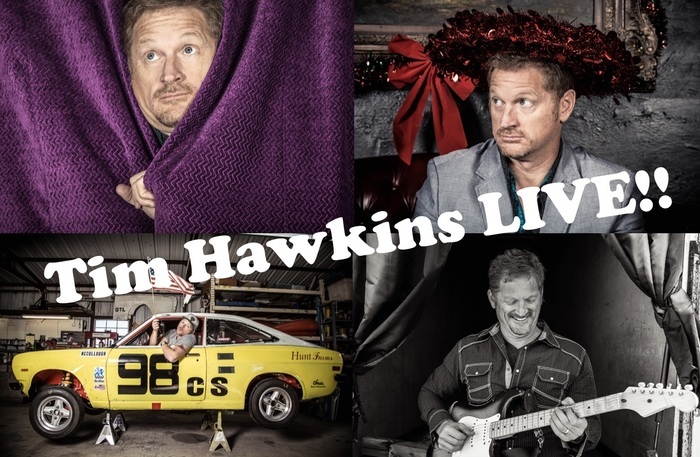 Then you will love TIM HAWKINS LIVE!!!! Coming Saturday, September 15, 2018 at 7:00 pm we will have the awesome Christian comedian, Tim Hawkins, live on stage. Tickets are on sale now and can be purchased on our website on the Upcoming Events page. Can't wait for this show!! It's opening night!!! 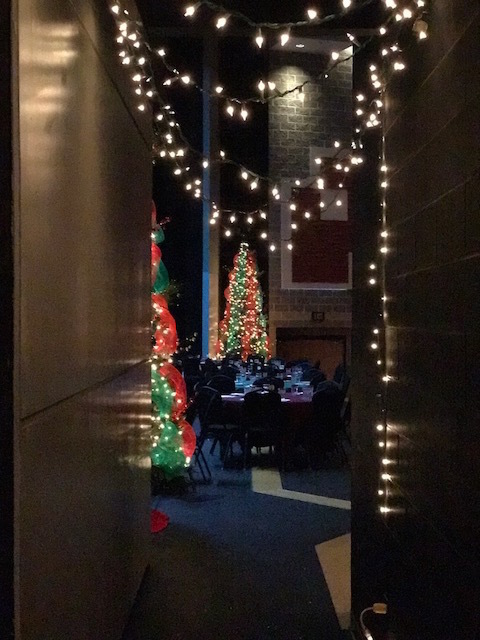 The Nutcracker takes the stage at 7:00 pm tonight and tomorrow night and at 2:00 pm on Sunday. Box Office will open one hour before show start each day. Tickets are $20 for adults, $10 for ages 13-21 and $5 for ages 12 and under. The Center lobby is decorated and ready for the holidays! Join us this weekend as we celebrate with The Nutcracker. Make sure to bring your camera to get those holiday pictures taken in front of our trees. Our volunteers are the best! Had a great time at our "Taco About How Awesome You Are" volunteer luncheon. The Center pARTners volunteers were recently honored during a luncheon and volunteer, Carol Shoptaw, was awarded Volunteer of the Year! Tickets available NOW for the "On a Winter's Night" The Music of the Trans Siberian Orchestra. Visit our Upcoming Events page to click the purchase tickets link. This event is a benefit concert for ACME (Arkansas Center for Music Education) and will be held on Saturday, November 11th at 7:00 pm. CANCELLED EVENT. 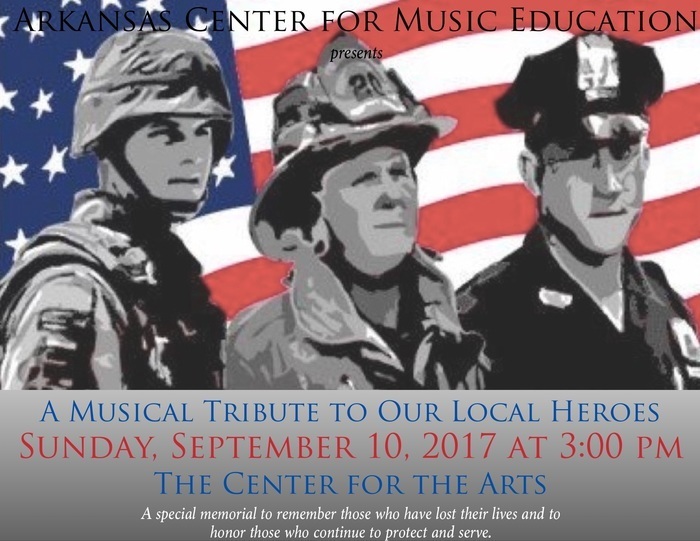 The Musical Tribute to Our Local Heroes concert scheduled for this Sunday, Sept. 10 has been cancelled. There will be no reschedule date for this year. The Musical Tribute to Local Heroes concert schedule for this Sunday, Sept. 10 has been CANCELLED. A new date will be released soon. FREE Concert Coming September 10th! What a fantastic show and great crowd we had Saturday night!! Donny Edwards is an incredible Elvis impersonator. Good news - he will be back! If you would like to receive advance notification of this show information contact us by email or phone at 470-498-6600 and we will add you to our list. 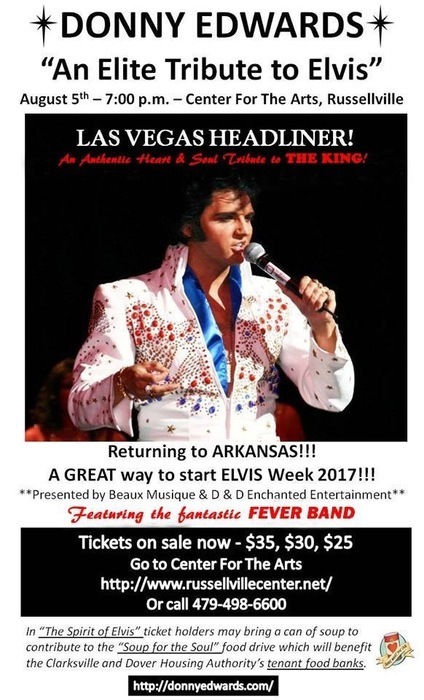 Elvis will be in the house August 5th! Well sort of. Join us as we welcome Donny Edwards to the stage with his Live Tribute to Elvis. Show will be at 7:00 pm and tickets are available now. Go to the Explore the Center tab and click ticket information and upcoming events to purchase tickets on line.